One of the most convenient ways to preserve space at your place is to use one of the best outdoor bike storage sheds. They are designed with durable and sturdy materials that enable them to protect your bike from dust, dirt, UV rays, and other elements. 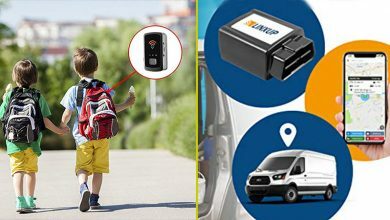 Most of them are also lockable to improve security. Outdoor bike storage sheds come in a variety of designs, and this can make it difficult to make up your mind on what you want to take home. For this reason, we have worked day and night to make sure you have the easiest experience buying one. The wrath of Mother Nature will not really be your concern if you have this outdoor bike storage shed. It has a space-saving size that measures 74 inches wide by 30 inches deep by 65 inches high. Well, the size is large enough to fit two adult bicycles and still leave a room to spare. Furthermore, this outdoor bike storage has a water-shedding design that not only stashes two adult bikes with much ease but also fits long-handled garden tools, pool supplies & floats, lawn mowers, kids’ toys, and other equipment that should be kept outdoors. The roof of this storage shed is made of top quality ripstop vinyl, and it provides UPF 50+ protection to ensure that the dangerous UV rays do not damage the content. 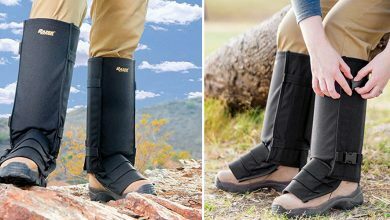 The body, on the other hand, is made of polyester and bonded to thick weather-resistant coating for superior durability. 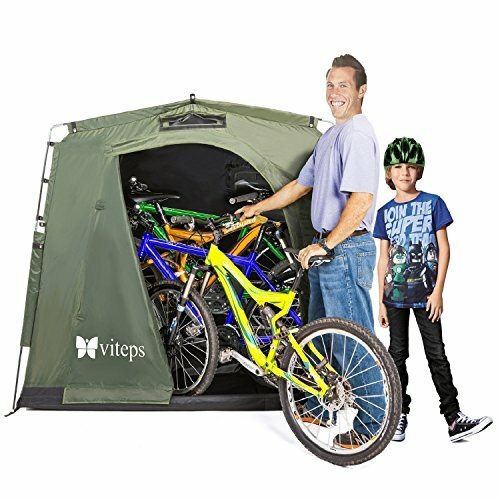 With a footprint measuring 74 inches wide by 32 inches deep by 68 inches high, this outdoor storage shed tent fits up to two adult bikes. And it still leaves room for stashing hard-to-store tools like lawnmowers, pool toys, long-handled garden tools, and furniture cushions, among others. 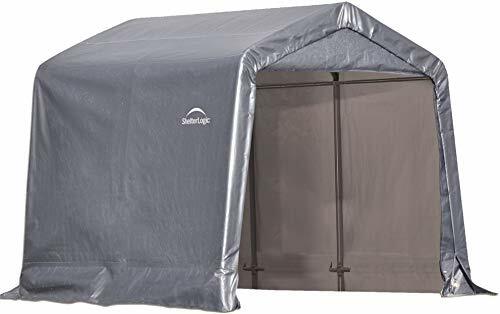 The storage shed tent also features rugged large rubber tabbed top and bottom zippers that have storm flaps to allow for effortless access as well as to provide maximum protection against pests, dust, and water. The seams of the shed tent are sealed, and there is also a patented snow-shedding roof design that offers protection throughout the 4 seasons. The front mesh vent helps get rid of condensation, while the back Velcro panel is for locking to a pole or fence. 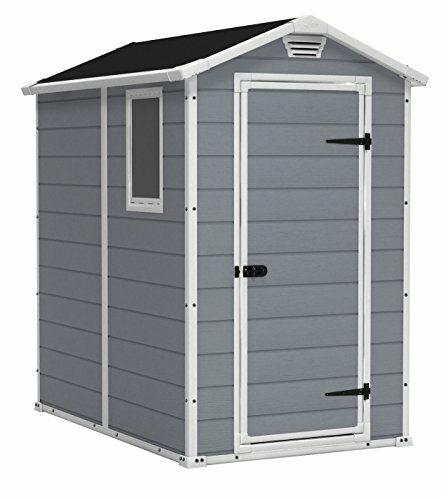 This storage shed comes with a free carrying bag for easy transportation and storage. 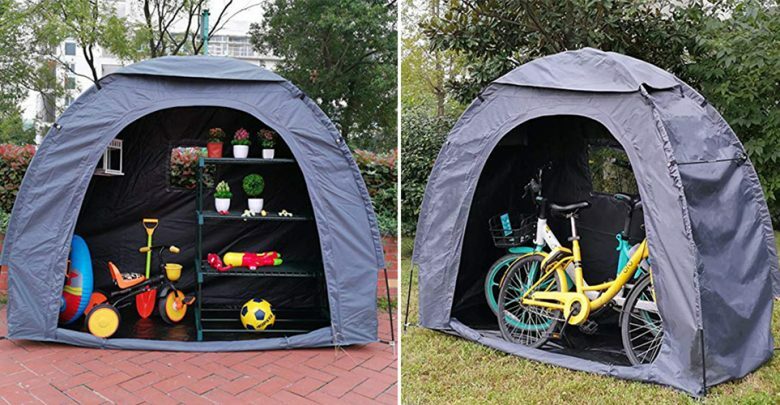 This outdoor bike storage shed is not just made for bicycles but also it is great for storing kids’ toys, gardening equipment, pool supplies & floats, and more. It is incredibly versatile, and this is because of its size. The storage shed measures 80 inches wide by 32 inches deep by 66 inches high. It is also very portable, meaning you can set it up anywhere. Talking of setting it up, the storage bike tent requires no assembly tools. Plus it comes with an assembly instruction sheet where you can refer to for successful assembly. 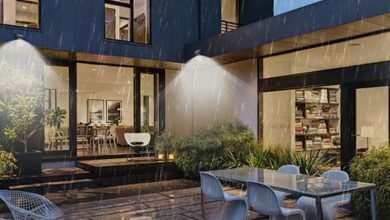 The materials used to make it are heavy-duty, weatherproof, ripstop, and UV protected. They keep the shed really sturdy and even enable it to provide real protection from outdoor elements. 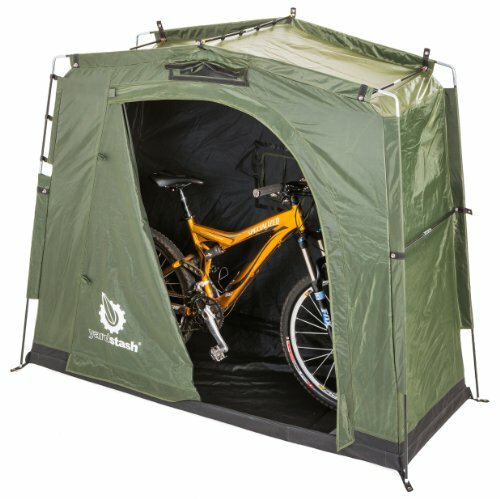 Despite having all the great features, this bike tent is unbelievably affordable. Ideally, it comes with a free carrying bag, which is a plus. Outdoor storage solutions should be much more convenient. But only if you are fortunate enough to end up with top quality storage shed like this one. Its exterior dimensions are 5’ 10-1/2” W by 3’ 8-1/4” D by 4’ 4” H. Its interior dimensions, on the other hand, are 5’ 5-1/2” W by 3’ 2-1/2” D by 4’ 1-1/2” H. With that said, this storage shed is large enough to keep smaller bicycles, patio cushions, garden supplies & tools, and more. You can also use it to keep up to two 96-gallon garbage containers. Its lid is easy to open to ensure that you have no problem accessing the content. Furthermore, the lid can be locked to give you peace of mind that whatever you stored is safe. The low maintenance design means you will have an easy time cleaning and maintaining the storage shed. The value of a bike cannot be underrated. That’s why we are proud to bring you the ALEKO SS70GR Pop Up Bike Tent. It measures 70 x 64 x 30 inches; thus, it is large enough to be relied on. The size, however, does not affect its weight, as it still remains one of the lightest outdoor bike storage sheds on the market. Because of its lightweight construction, this bike tent is definitely easy to carry. It even comes with a carry bag that has a handle to allow for easy transportation or storage when the tent is not in use. 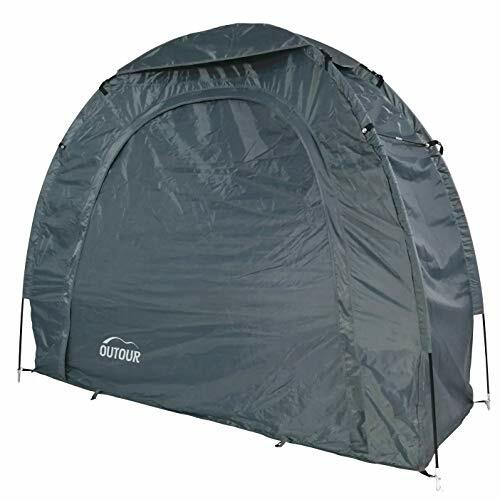 It sets up like a regular tent, and this means you will not break a sweat assembling it. Moreover, it comes with connecting poles, rope, and pegs to allow you to secure it into the ground. 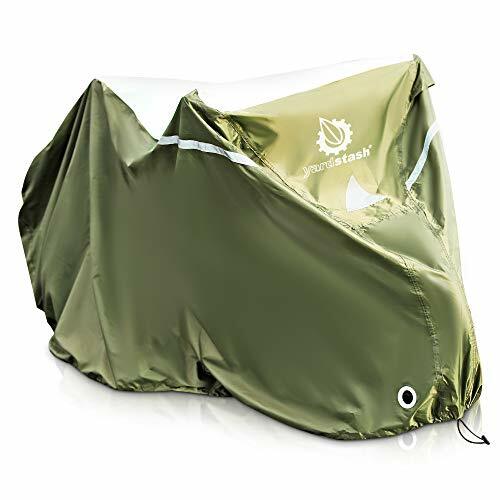 It is a weather-resistant tent that will no doubt protect your bike from elements. There are some manufacturers that you cannot just overlook when it comes to best-performing outdoor bike storage sheds. 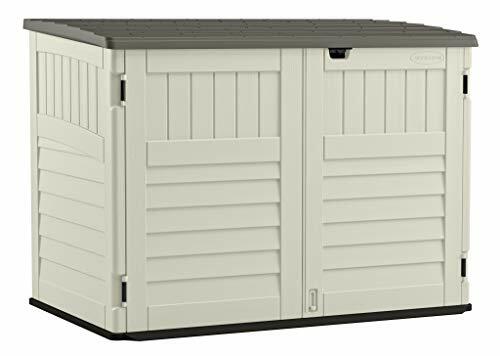 One of the manufacturers is Keter, which produces top quality outdoor products like this large 4’ by 6’ outdoor storage shed. Its external dimensions are 51.2 inches wide by 75.6 inches deep by 78 inches high, while its interior dimensions are 43.7 inches wide by 69.7 inches deep by 74.8 inches high. And its storage capacity is 131.8 cu. ft. Well, this is large enough to perfectly fit your bike. Ideally, the ceiling of this outdoor storage shed is high enough to allow an adult bike to move around easily. Keter has not just focused on the capacity of this storage shed but also it has paid enough attention to the aesthetics of this unit. That being said, they have included a stylish wood-like texture to complement any home décor. Very few outdoor bike storage sheds come with a warranty. And we are glad to inform you that this particular product is one of them. It comes backed by a 2-year guarantee to give you confidence in purchasing it. Besides, we are thrilled by the fact that the extra-large bicycle cover comes with a free carrying bag that comes in handy when you want to transport or store it after use. 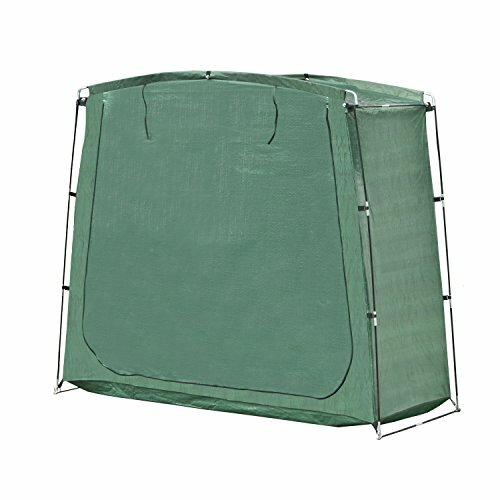 The cover is built to stand up to windy conditions extremely well. And the features that enable it to achieve that are the elasticized front, middle clasp buckle, and back hems. The cover also has front air vents that eliminate condensation and corrosion. In addition, it comes equipped with large front eyelets to help you lock your bike for maximum security. 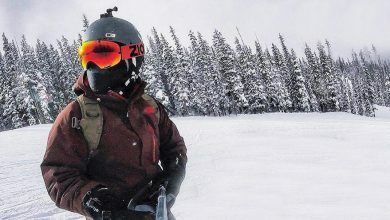 It is a well-made cover that offers maximum protection against rain, snow, dust, and dirt. Your bike deserves to be well protected in order to last longer. And one of the most convenient and easiest ways to improve the lifespan of your bike is to use quality storage shed like the MayBron Gear Bike Cover. It measures 78 inches long by 30 inches wide by 40 inches high, and it greatly fits bikes with wheel sizes ranging from 24” – 27.5”. What’s more, the bike cover is ideal for bikes with wide handlebars. As such, it should be a frontier for you if you have a mountain bike, beach cruiser, electric bike, city bike or road bike. When it is not in use, the cover can be packed neatly and carried anywhere. MayBron has protected it by a 2-year replacement warranty as well as a 60-day refund guarantee to give you peace of mind during purchase. When assembled, this outdoor bike storage shed measures 8’ by 8’ by 8’, and its interior measures 7’9” by 7’9” by 7’11”. The shed has a storage space of 64 square feet; hence, it is large enough to store snow blowers, pool items, ATVs, snowmobiles, mowers, and garden tools. The manufacturer has backed the storage shed by a 1-year limited warranty to protect against defects and poor workmanship. They have also included patented Shelter Lock stabilizers that ensure rock-solid stability, which, in turn, delivers a stable and more durable shelter. Besides, the storage shed has the cover tensioning system that helps keep it tight and neat looking. It is a high-functioning storage shed built to last. And this can be proven by the powder-coated finish, which prevents corrosion, peeling, rust, and chipping. We are certain that you will find it handy. The tent is 75 inches high by 60 inches deep by 65 inches wide. It is big enough to store more than one bike and even double as a camping tent. You can also use it to store pool supplies, kids’ toys, gardening equipment, and other things that need to be stored. The shed tent is so easy to set up that you do not need to be handy to be able to put it together. Assembling it takes 15 minutes or less and does not require tools. 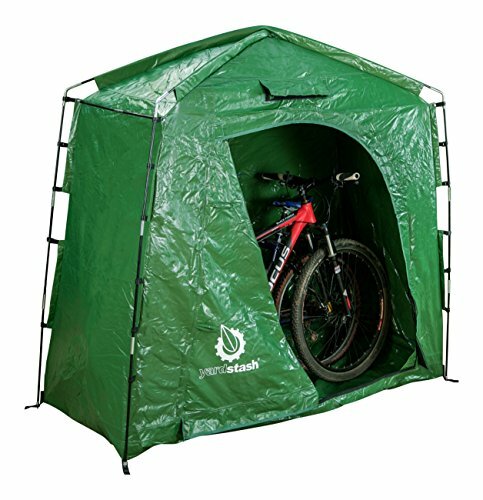 Like most top quality outdoor bike storage sheds, this one comes with a carrying bag to make it extremely easy to carry around or store. 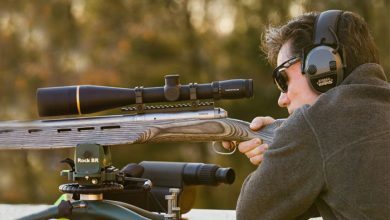 It is made of heavy-duty, weatherproof, tough, and UV protected materials to enable it to provide great protection. Having this tent will make you more organized let alone helping you save space. If you want to end up with a top quality outdoor bike storage shed, then the following factors are worth going through as well. You should choose an outdoor bike storage shed depending on the size of your bike. That is to say, if you have an adult bike, you should consider a bike storage shed that is a little bigger both at the footprint and height. Also, you should consider a large bike storage shed if you have several bikes to store. A good number of outdoor bike storage sheds are portable. Well, it is important to consider a portable storage shed for bikes because they are much more convenient than those, which are not portable. With that said, look for a bike shed that is lightweight and easy to set up. 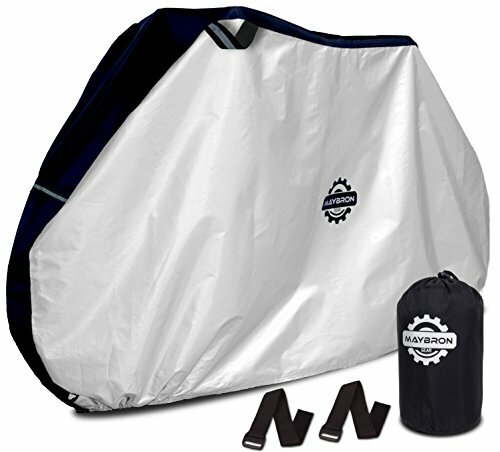 If possible, choose a bike storage shed that comes with a carry bag. Buying an outdoor bike storage shed with a top quality material will go a long way to improving the lifespan of your bike. For this reason, make sure that the outdoor bike storage shed you choose is made of a durable material that provides protection against dust, dirt, UV, and more. How secure are outdoor bike storage sheds? Most outdoor bike storage sheds have lockable doors/lids to make sure that it’s only you who can get access to your bike. Some also have eyelets where you can pass the chain through to lock your bike. Can I build an outdoor bike storage shed? Yes, you can. But, because you need to get the measurements right and meet some specifications, building a shed for your bike is not highly recommended. What’s the best color for an outdoor bike storage shed? We think you should go for a green bike storage shed. This is because green camouflages perfectly on the backyard. If you cannot get a green bike storage shed, consider a black one, as this camouflages well too, especially at night when bike thieves are likely to be very active. Do not congest your home with things that can be stored elsewhere. We are not just talking about bicycles but also we are referring to lawnmowers, garden supplies & tools, pool items, and other equipment. The above outdoor bike storage sheds will help free up space at your place and even help you stay neat and organized.